I don’t exactly get the idea behind gender specific toys. Okay, I understand that once upon a time, little girls wore dresses and boys wore short pants until they were old enough to be breeched. And then they went their separate ways: boys learned manly arts like hunting and finances while girls learned things like making lace and needlepoint. That was a long time ago. Most of us raising children today were born in the 1970s, 1980s, and 1990s. It’s been quite some time since the equal rights movement took place. That means that if Eudora wants to play with GI Joe when she’s big enough, she can. (Well, without the guns, but that’s another blog post.) That means that if Norton decides that he wants to have a doll of his own, he can. Or he can even *gasp* wear pinks and purples. Heck, if I’m lucky, neither will care about gender specific toys and will learn to share nicely. What do you think? Is the Easy Bake Oven just for girls while the Vtech Baby’s Learning Laptop is just for boys? Or does it not matter? I don’t get it. I’ve never understood it. When I was younger, I wasn’t allowed to play with Hot Wheels, because they were “boy toys.” Instead, I was forced to play with Barbie. I HATED Barbie (still do, but that’s another discussion for another day). My mom and aunt grew up in a different era. These days, few of those who denied me my Hot Wheels would do the same to their grandchildren. Times have changed. Formely ignorant people are also slowly learning that the toys one plays with as a child have no impact on your sexual orientation or gender identity, not that it should matter even if they could. Yet, in these so-called modern and enlightened times, every year I see some stupid debate on Facebook about whether someone should buy a kitchen or doll for his/her son or a football for his/her daughter. Interestingly, the footballs for girls are generally better received than kitchens and dolls for boys, which I think is a sad statement about our society and perceptions of masculinity… But whatever. Hopefully one day the toy movement will catch up to the equal rights movement. I won’t hold my breath, though. Ah it doen’t matter. I have a 10 year old daughter and I cringe whenever Skylanders is called the it toy for boys this year. I want to yell AND GIRLS TOO! Silly marketes. People have definitely gotten ridiculous about this type of stuff. I don’t think the toy defines what the child is going to be when they grow up. Let them play! I never played with baribe but did lots of cars. I’m an excellent road builder. The kids can play with whatever they wish. My son has dolls and my daughters have cars and blocks and a whittling set. My son and husband play dolls with the girls better than I do. They don’t like me playing ’cause I just don’t “get it”. DH does and he’s a big ol’ man so it’s extra sweet to see someone who was raised in a family with obvious stereotypes evolve past his upbringing. Oh…my son…13. And, he’ll play with my girls just like he’s playing a video game or such. It’s an activity to do and anyone is allowed to join in. I let my kids play with what they wanted ” as long as it was safe”. The idea of gender specific toys really is ridiculous. I also hate that all the toy babies and cleaning items (broom, vacuum, etc) are all in pink in the “girls'” section of the store. I’m going to have a daughter soon, and I already have a son…I wonder if I’m supposed to keep their toys separated? haha…such an odd society we live in sometimes. I have no problem with gender specific toys. I played cops and robbers with my brother as a kid and one time he played Barbies with my sister and I. My boys play with whatever they want to, too. They have one female cousin that they are incredibly close to and she dresses them up as princess’ and they don’t seem to care. Toys are toys. They can be pink and be mostly geared towards girls, then so be it, that doesn’t mean it is off limits to boys. Same for girls. When my niece comes here, we only have boy toys and she plays with the cars and trucks, no problem. My kids are kind of growing up in the same sense that I did, play with what you want, who cares, it’s a kid thing. That would suggest, then, that you’re not okay with gender specific toys in particular since you’re encouraging and accepting of use by the “wrong” gendered child…. I’m all for girly, frilly, and mommy-ish toys for girls. I’m all for cars, footballs, and super hero figurines for boys. 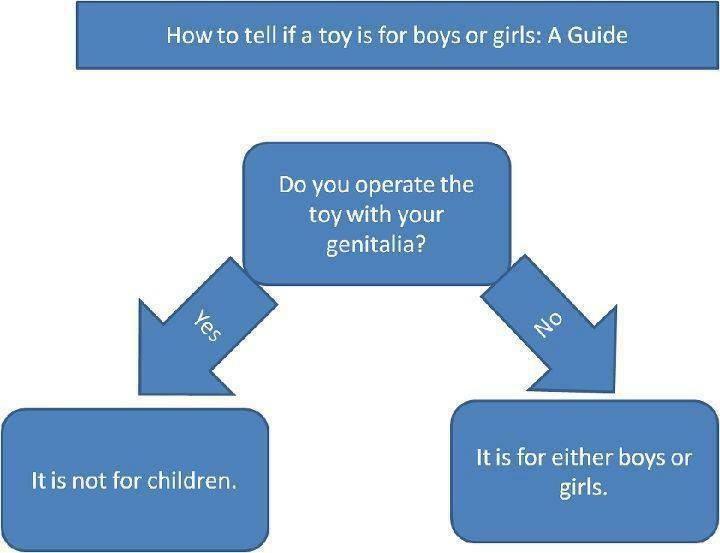 I only buy gender specific toys for my kids. However, if they asked for a baby doll, I’d buy them one too. They have just never asked. KWIM? Agreed! My daughter loves Legos,as do many kids of both genders, and I was kind of annoyed when girl-specific Legos were marketed. I guess it’s okay, but I don’t think kids should think “oh these Legos are just for me, those other ones are for boys” or vice-versa. I don’t mind the “girly” colored Legos, but the “Lego salon” and so forth are just kind of… well, lame.